Let's Make Some Boiled Quinoa! Boiled quinoa is quick and simple to make, and all you need is a pot or large pan with a lid. It's totally foolproof. This technique will quickly become a favorite of yours, I guarantee. You might notice that I use quinoa in my cooking...like, a LOT. That's because it cooks up quickly and it's an excellent source of vegan protein. 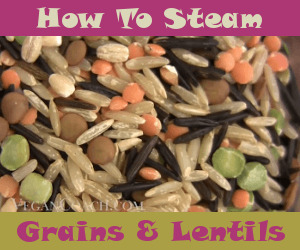 It goes great with just about anything, including veggies, beans, greens...even mixed with other grains. So because I make quinoa so much, I have learned a lot about it over the years. 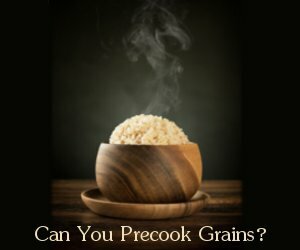 And one thing has become quite clear and that is that pre-soaking it before cooking cuts down on any anti-nutrients in the grain itself. 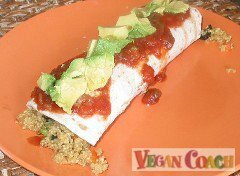 In addition, the quinoa becomes more digestible if soaked before cooking. The choice is yours. If you have the time, I recommend pre-soaking in triple the amount of water overnight, or at least 6-8 hours. 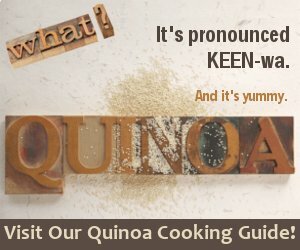 Otherwise, rinse your quinoa well as described in our Quinoa Cooking Guide. This is very important to ensure your finished dish is free from the bitter flavor found in its natural built-in coating. 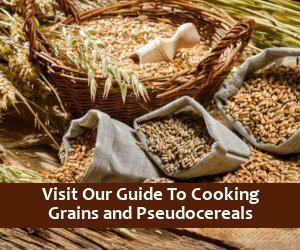 Alternatively, you can toast your quinoa in a dry pan or a medium pot, stirring occasionally, until you smell the toasted aroma and the grains start popping and dancing in the pan. You can use plain water or vegetable stock for the cooking liquid. The veggie stock can help to mask the grassy taste found in some varieties. Bring about 1/4 - 1/2 cup veggie stock or water to a boil in a large pan or a medium pot. Add your pre-soaked quinoa (originally 1 cup, but by now after soaking first it will have expanded to more than 1 cup). Cook for about 5 minutes or so, stirring occasionally, covered, until tender. It really won't take long for your quinoa to cook since it's presoaked. Bring 3 cups of veggie stock or water to a boil in a large pan or a medium pot. Add 1 1/2 cups thoroughly rinsed quinoa and a little salt (optional). (Alternatively, you can also toast your quinoa in the dry pan/pot to remove the bitter coating from it, then carefully add boiling veggie stock or water.) Return to a boil, reduce the heat and simmer, covered, for about 15 minutes. Turn off the heat and let stand, covered, for 5 minutes. Fluff with a fork. Either way, makes about 3 1/2 cups. Now, let's have some fun and play with our food, shall we? 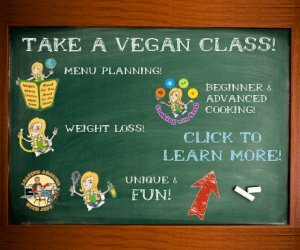 Use the "Quinoa Flavor Matches" to whip up your own delectable quinoa recipes!